Majoid Crabs: In the Spirit of the Season! As we approach the holiday season, humans around many places in the world are decorating all manner of trees, homes, and wreaths. Some even decorate their pets! And although the tradition of the colorful red green and silver tinsel only goes back as far as the late Victorian period, (late 1800's), some species other than humans have decorated themselves for much longer. A good example is the Majoid crab, also known as the decorator crab, that adds bits of algae and other bits of material to their appendages to hide from predators. Researchers at the University of Delaware wanted to determine how quickly the crabs decorated themselves, and if they did it with and without a place to hide. The experiment was fairly simple; have two separate containers, one with a habitat and one without a place to hide. Then, using wet craft pom-poms so that they would sink to the bottom of the container, the crabs were photographed every hour for 24 hours. In both containers most of the crabs were decorated within 6 hours. All of the crabs were completely covered after 24 hours. The difference was in which part of their body they protected first. If a habitat was available, the crabs decorated their appendages first and the ones without a place to hide, decorated the entire body. Since the crabs do not have color vision they probably failed to recognize that they were celebrating a holiday. "Tis the season"! "If you were hoping to add a dollop of whipped cream to your apple pie this holiday season, then you’d better head to the store and start filling up your shopping cart early. Some supermarkets and manufacturers are warning customers that due to a national shortage of nitrous oxide, certain canned whipped cream products may be missing from the shelves. An incident at a Florida facility in August has impacted the production of the gas that shoots whipped cream from canisters and onto desserts, leaving some stores that sell the fluffy white topping strapped before Christmas. Conagra Foods, which makes Reddi-wip, said the industry-wide issue affects any company that relies on nitrous oxide in their products, including private labels and competitive brands.Lanie Friedman, a Conagra spokeswoman, said in a statement that the company is doing its best to make its whipped cream available to as many consumers as possible. In the meantime, they’re encouraging shoppers to “stock up early,” during the peak season. “We should have our full supply up and running by February,” Friedman said". The Library of Congress in the research and repository arm of most of the history of the United States. The cover photo is the west façade taken in 1898. But it is international in content. And, although a trip to the library would be a worthwhile adventure, the online photo archive is the next best activity. The library is the largest in the world followed by the British Library. The collections of the Prints and Photographs Division include photographs, fine and popular prints and drawings, posters, and architectural and engineering drawings. While international in scope, the collections are particularly rich in materials produced in, or documenting the history of, the United States and the lives, interests and achievements of the American people. If you have an interest in history, photography, or are just curious about how we developed as a nation, then this is the site for you. The collections have thumbnails and offer several different download quality options up to the TIFF which will open in Photoshop. The content is incredible from stark images of the civil war to the war years and education, industry, life in general, and entertainment. There are black and white as well as color images. Each photo has the history of the photo and identification and most important, whether or not it is public domain or has publishing restrictions. So, the responsibility for checking ownership is up to the person using it for commercial purposes. Prepare to be dazzled and the link is ﻿here﻿. Below is one of the images from 1940 in Melrose, Louisiana. 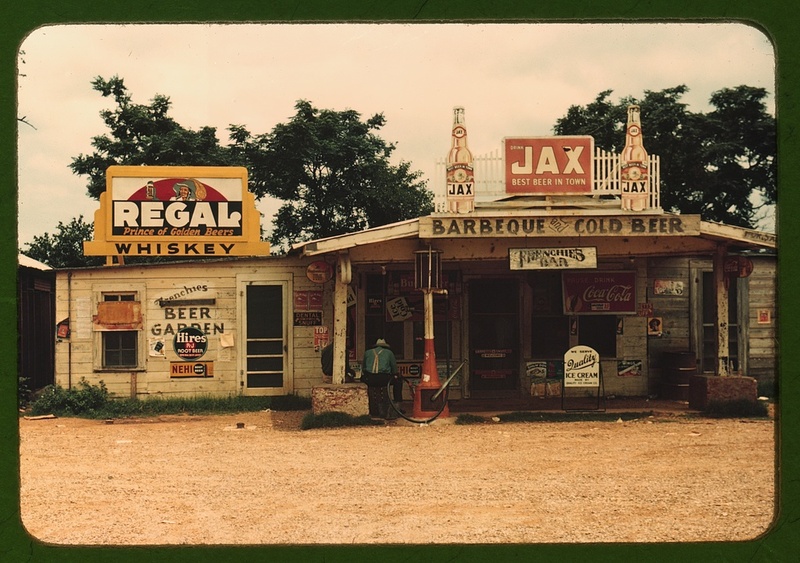 It is a Bar, Store, and Juke Joint. Enjoy!